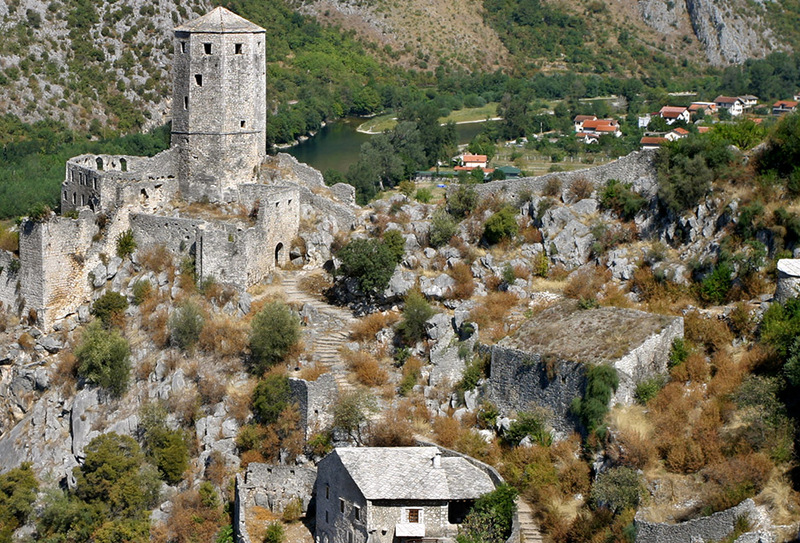 Mostar, Herzegovina, BiH travel photos — Hey Brian? 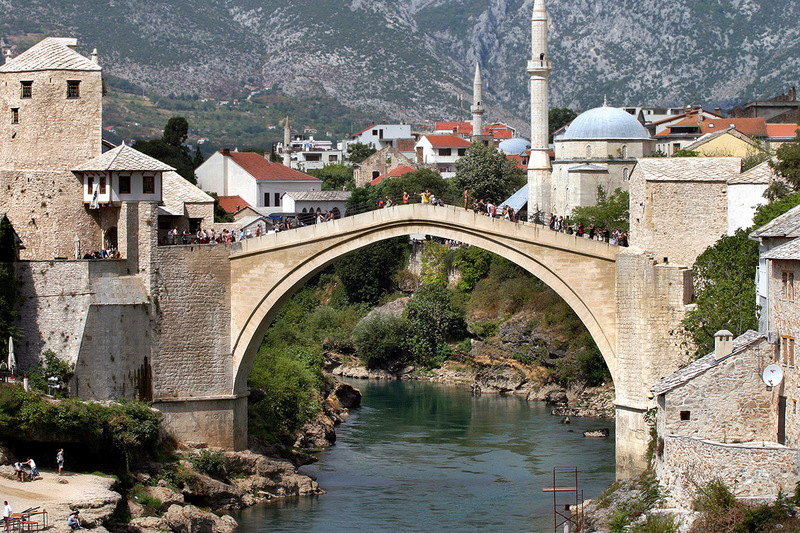 This 16th century bridge was destroyed in November 1993 during the Croat-Bosniak War. It was decided to build a bridge as similar as possible to the original, using the same technology and materials. 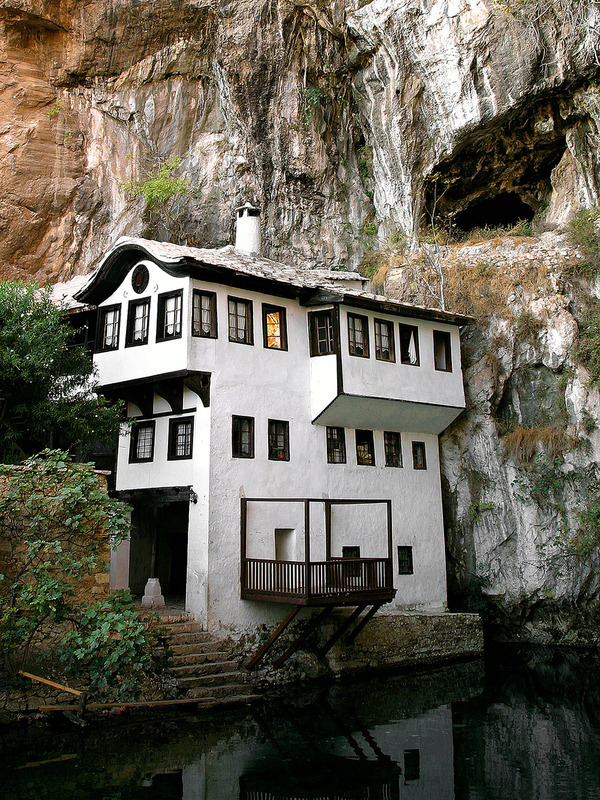 This 17th-century Dervish house stands at the karstic spring source of the Buna river. 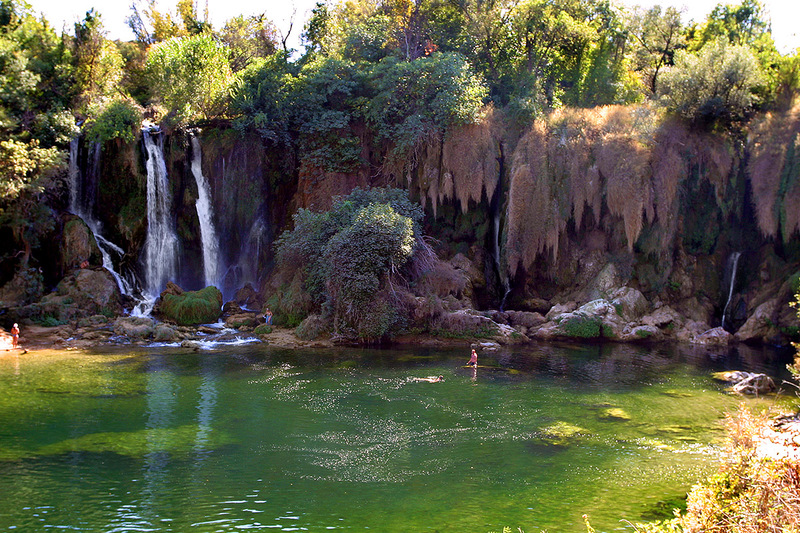 It is also called Vrelo Bune. Hopefully this beauty has been repaired by now. 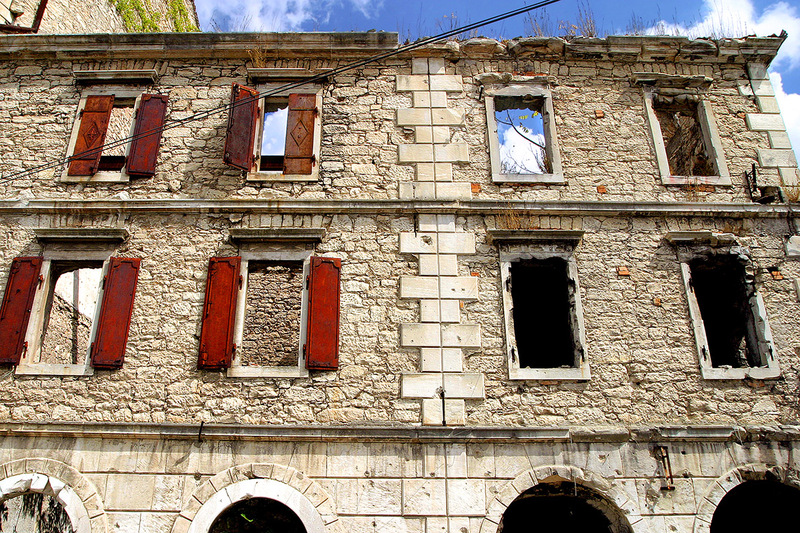 This town was one of the most heavily bombed during the 1993 Bosnian War. My bus exits Croatia and arrives to Neum, Bosnia, where an immigration official quicly inspects our bus. 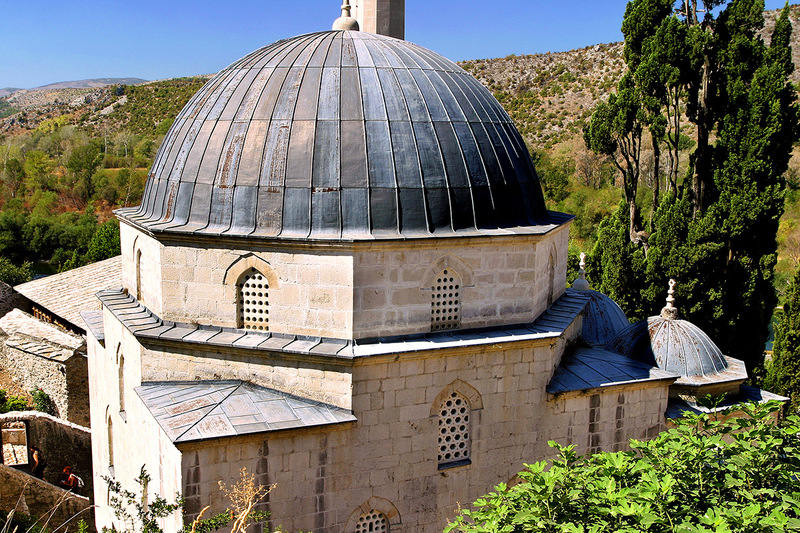 Interestingly, Neum is the only town situated along Bosnia and Herzegovina's 20 km (12 mi) of coastline, making it the country’s only access to the Adriatic Sea. 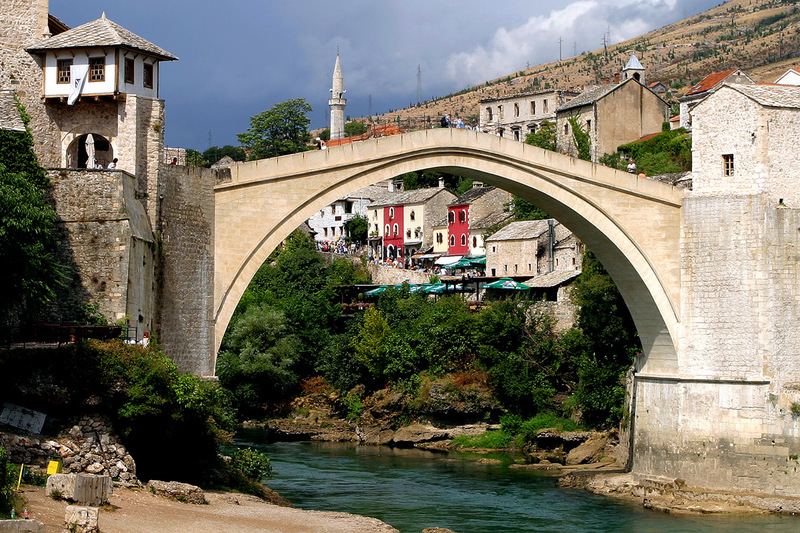 We then head north on a windy road and arrive to Mostar, Bosnia, around 8:00pm. I am met by a fellow named Bata at the bus station. Bata leads me to the Majdas Rooms guesthouse, on Franje Milicevica (road) where I pay €11.90 for a bed in a shared-room. I take an evening walk around town and enjoy the crisp, cool air. I feel like I am in a vey remoe portion of Europe. 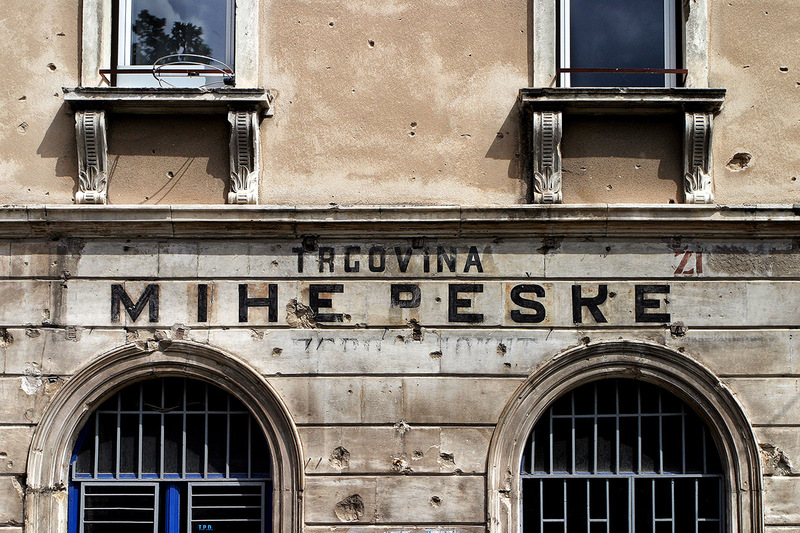 I board the ŽFBH train and enjoy an excellent windy ride in the old-school train through the mountains to Sarajevo in the region of Bosnia. I am met by a man at the train station about twenty minutes after I arrive. He takes me to the Haris' Hostel where I rent a bunk in a room with about 12 other beds. There are many Brits staying here, drinking, playing cards and having a good time. 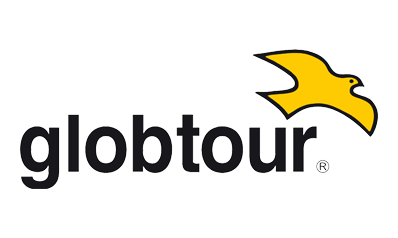 I take a taxi to the Istočno Sarajevo bus station and buy a ticket for the Topolatrans 43 mini-bus to Beograd for for 29 Bosnian marks. 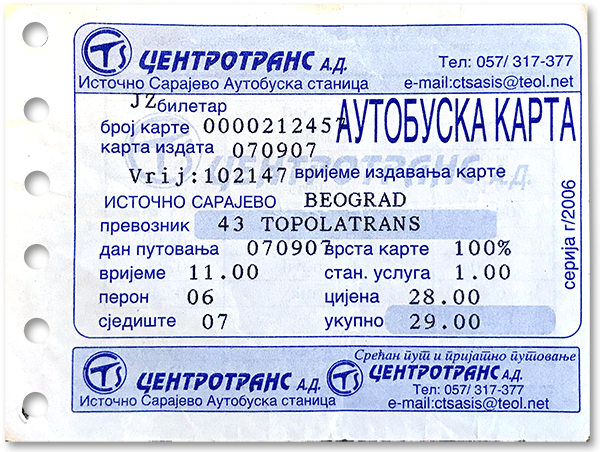 The ticket is printed in Bosnian cyrillic; I hope I bought the correct fare and destination. I make a note that I should learn to read this neat-looking alphabet. 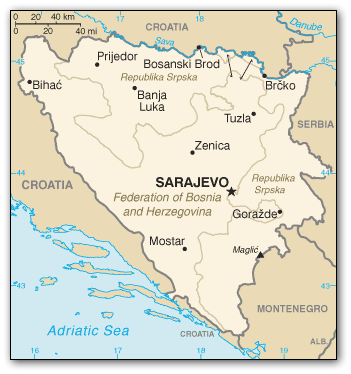 All is indeed correct and we leave Sarajevo at 11:00 and travel east through the Republika Srpskato and on to Belgrade, Serbia. The scenery is quite pleasant, green hills dotted with quaint villages. I want to stop in each place and spend time. For some reason I become quite sentimental and listen to the Julio Iglesias album Julio, which reminds me of my Mom and cheers me up.